Electronic Kit School. - There are many electronic circuit design to give best result now for motor speed controller. One electronic circuit of induction motor speed controller, 3 phase which designed is look like in Figure 1 below. The main component to controller this motor is NE555 IC which popular today. In this time, beside we will show you the circuit, here we also will show you component part and global description about this circuit. Circuit like in Figure 1 above show you about the 3 Phase Induction Motor Speed Controller using NE555 IC. From Homemade-Circuits site describe that when it comes to controlling the speed of induction motors, normally matrix converters are employed, involving many complex stages such as LC filters, bi-directional arrays of switches (using IGBTs) etc. All these for ultimately achieving a chopped AC signal whose duty cycle could be adjusted using a complex microcontroller circuit, finally providing the required motor speed control. 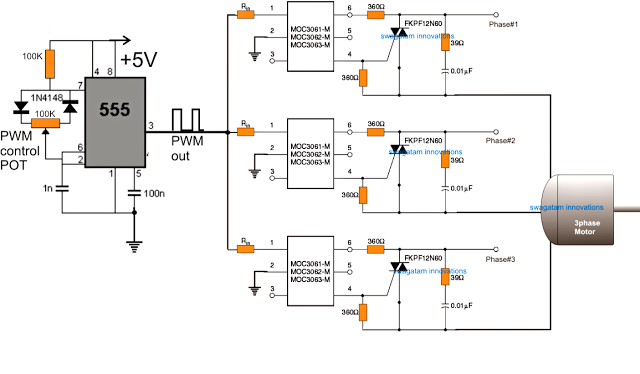 However according to me the same can be accomplished through a much simpler concept using the advanced zero crossing detector opto coupler ICs, a power triac and a PWM circuit. Thanks to the MOC series of optocouplers which has made triac control circuits extremely safe and easy to configure, and allow a hassle free PWM integration for the intended controls.